Rooster Ride [W5281] - $9.98 : Yarn Tree, Your wholesale source for cross stitch supplies. 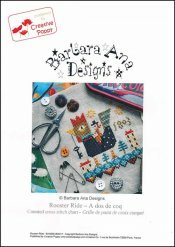 A cross stitch pattern from Barbara Ana Designs. This little lady, riding an oversize rooster, seems to be setting off for some new adventures, leaving the village behind. The rooster holds a key. Is it the key to her dreams? This modest size design is in true Barbara Ana style, stitched in colorful threads with interesting tones, whimsical and full of symbolism. Stitch count 50 x 56.